Del Prado Farms – An adventure in accidental avocado farming and related enterprises. When we bought our grove, Jack was about 6 months old. Naturally, we started feeding him avocados from our trees immediately and he has had a love affair with them ever since. He has turned into The AvoKiddo! Check out the short video starring The AvoKiddo. It’s a new year, so if one of your goals is to help your family eat healthier, start with some avocados. In the spirit of New Year top lists, here are 5 great ways to add a little avocado to your kids’ meals. You can turn them into AvoKiddos without them even knowing it! Start them young. While Jack loves avos, my other two boys are reluctant to even try them, you know, because of that dreadful color green. I failed to get them hooked while they were young. Infants love mashed avocados and they are the best first fruit to introduce. To top it off, they are packed with folate, fiber, potassium, and vitamin E – all much needed essentials for your growing baby. This is also the first step to loving guacamole. I set out fresh made guacamole and some tortilla chips one day, walked away for a few minutes, and returned to find Jack using a chip to scoop out the guacamole, lick it off, and re-dip the same chip for more! Just add a little lime, cilantro, salt, and mild spices. Give them chips and let them make a mess dipping away. Mix it up with fruit and nuts. My kids still won’t eat salad, but a bowl of sliced avocados with some pomegranate seeds, tangerine slices, and toasted chopped pecans will get gobbled up. It’s fun picking out the little pomegranates and nuts, too. Add a little diced chicken and cheese cubes for some more protein. Hide it in a sandwich. Instead of mayonnaise, which my kids hate anyway, try adding a few slices of avocado lightly salted along with some grilled chicken breast on your kid’s favorite bread. Another winner is bacon and avocado on toast. Blend it up into a smoothie. Using a blender, mix 1 avocado, 1 banana, 1/2 cup of your kid’s favorite yoghurt (Brown Cow is awesome), 1 cup vanilla almond milk, and 1 to 2 cups of ice. Alternatively, skip the ice, and make sure the banana is frozen. Yummy and healthy with breakfast or a snack. Learn more about the awesome benefits of avocados at the California Avocado Commission website. California has been in the throws of a major drought for over a year now, and both rainfall and surface flows from the mountains have been way below average for several years in a row. The map above from the USDA’s National Drought Mitigation Center, provides a pretty good picture. Other drought related information is provided in links at the bottom of this post. This past winter, we only had two storms that I can recall. Governor Brown declared a state of emergency on January 17. And nary a drop of rain has hit the ground since February – until recently – TWO weekends in a row! A few weekends ago, the boys and I were so excited about the sound of thunder and feel of rain that we ran around and danced outside until soaked through. Evan made a mini-shelter of our patio furniture so he could stay out and watch the whole storm. And then the next weekend (on the day we had planned a pool party for Evan’s birthday), it rained steadily the entire day. It didn’t stop the boys from having fun at the pool! It was extremely unusual to have such a lengthy storm in the middle of summer in Southern California. A unique microclimate exists where our little grove is located. While the surrounding areas get about 7 inches of average annual rainfall, the De Luz area usually gets twice that average. But last year, we got barely above 8 inches. But hopefully, the tide is turning. According to historical weather data, we are now 10 times the normal average for the season (which starts July 1). Of course, when the normal average for the summer is only 0.06, achieving ten times that amount is not inconceivable. We are all hoping, though, that this is a sign that we will have a wonderfully wet year. It will get all our baby trees off to a good start. 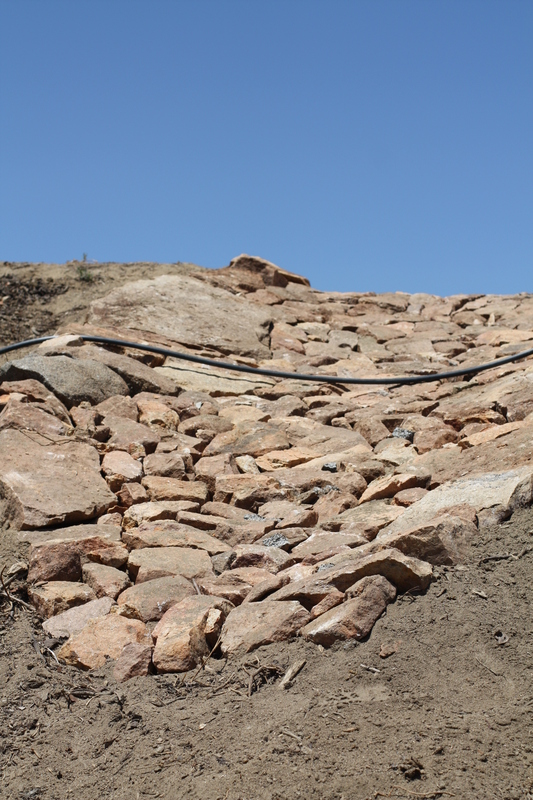 Riprap lining to control erosion. Luckily as part of our redevelopment, Gary fixed a lot of the erosion issues that were happening on the property. We have a graded pad at the top of the property which had several large gullies starting to form. It’s good to take the opportunity now to implement best practices and prepare for potential rains to come (as an environmental consultant, I have to plug this! 🙂 ). 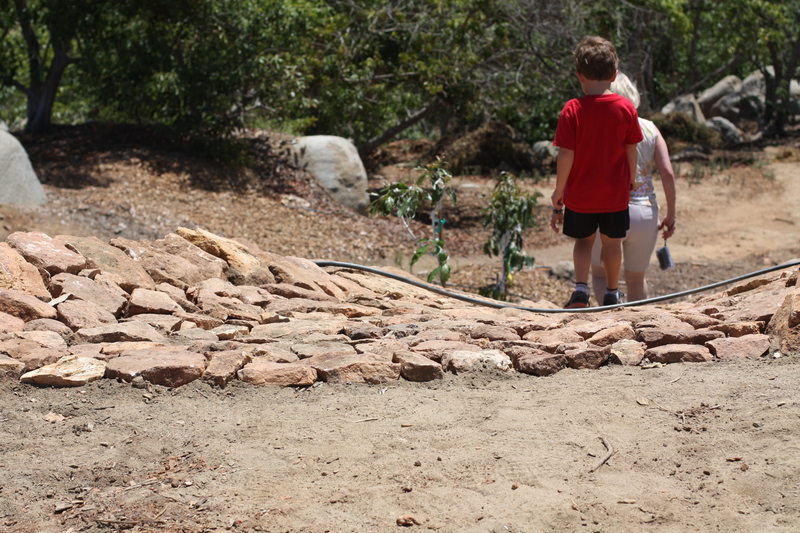 The whole pad was regraded and a riprap lining was installed in the biggest problem area using rocks found while digging holes for the baby trees. Check out the result. Evan and my mom walking down the spillway toward the baby trees. Speaking of the baby trees, they are doing well. We recently visited and they looked perky after the rains. Gary just made a third application of fertilizers for the year. He also made a second application to all our stumped trees and did another round of phosphorus injections. (See previous posts for fertilizer types and amounts, if curious). This time of year, the weeds can get big, so his crew recently did a lot of weed whacking, hand-pulling, and applied some roundup in the grove. The grove is beautiful this time of year with the trees exploding in dark green growth, walnut-size baby avocados peeping out here and there, the buzz of bees everywhere, and a blissful breeze flowing from the west. We recently visited the grove to check out the redevelopment, the first phase of which was completed in early May. 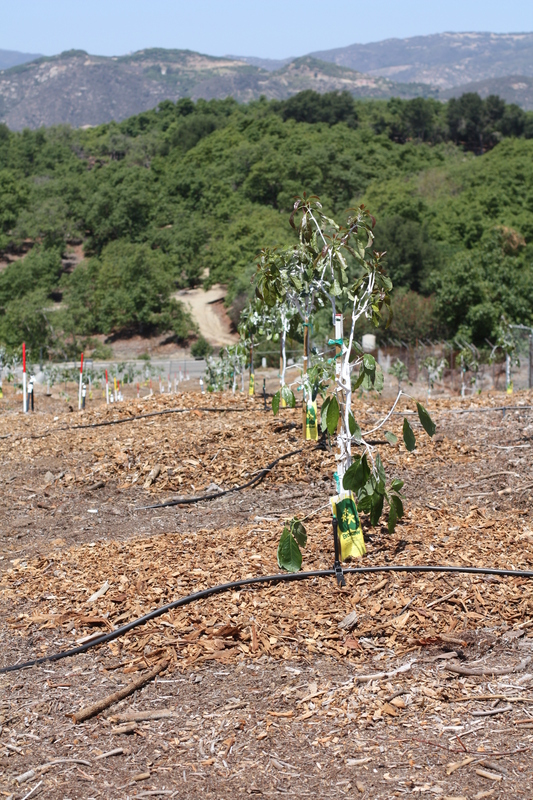 As we pulled up the drive, we couldn’t contain the excitement at seeing the transformation from a dying and barren grove to perfect rows of hundreds of baby avocado trees. Our manager, Gary Dicks and his crew, did an amazing job. Here’s what went into it. Compost mulch for the planting mounds. Prepped mounds with flags and compost. The grove was prepped and cleaned of debris. Gary engineered the new layout on high-density 15′ X 15′ spacing plan. Each spot is flagged on the center. Using a small front-end loader, tiller and hand labor, crews tilled an approximate 4′ X 4′ area to mix native soil, compost and organic gypsum. They hauled a large mound of chip material (using the old wood chips from the avocado trees we removed in the fall), placing it next to each planting site to be used for top dressing mulch after planting. A total of 262 spots were prepped. Our 5-acre grove is split into 5 main blocks, allowing water to be controlled differently in each block. A sub-line water main runs through the property with “block” ball valves to control the water flow to each block. Then there are secondary “hose-bib” ball valves to control the irrigation lines to the trees themselves. This gives us a good amount of control to vary the irrigation to meet the trees’ needs. New valves and pressure gauges. Crews dug new sub-main line trenches by hand. They installed a new 1 1/2″ SCH 40 PVC sub-main water line along with new 1 1/2″ block ball valves with pressure gauges and 3/4 ” hose bib valves with pressure regulators for lateral irrigation lines. A whopping 4500 feet of 1/2″ above ground poly hose lateral irrigation lines were laid. We had permanent, in-ground irrigation previously. I believe the above-ground irrigation is used because trees may be removed in the future to reduce the density as they grow. So this will allow the irrigation to me moved and changed easily. 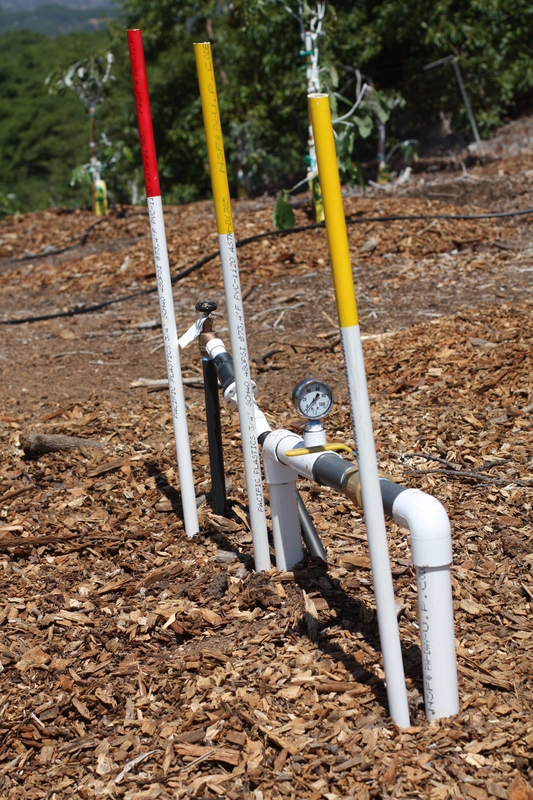 At each planting spot, they installed poly hose bases with 8″ risers and 20 gph half-circle micro jet sprinklers. All old block ball valves were replaced throughout the grove, not just in new planting areas. Each location of a block ball valve was staked and painted yellow while each hose bib valve was staked and painted red. The crews backfilled and compacted all trenches. They then pressure tested the entire irrigation system, cleaned sprinkler heads and checked for leaks. Before planting the trees, the crews irrigated each mound with 200 gallons of water. 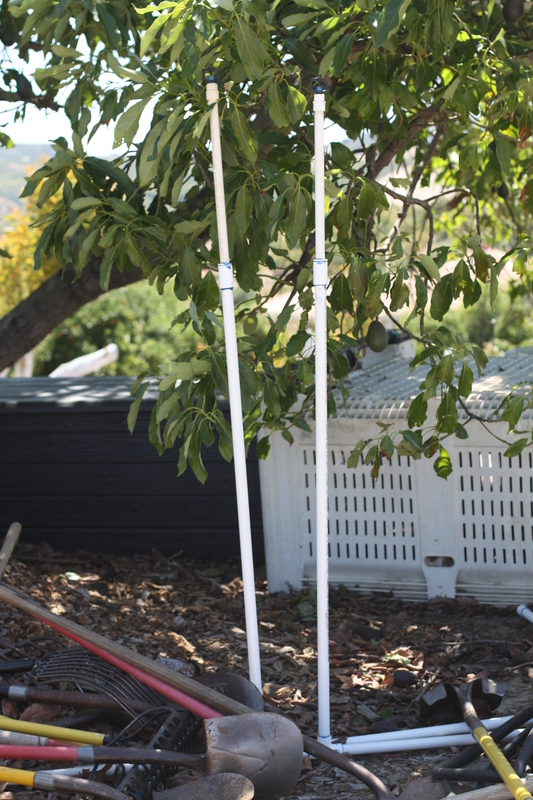 We planted 260 certified Hass avocado and 2 Reed avocado trees on Clonal Dusa (Merensky 2) root stock purchased from Brokaw Nursery in Ventura, CA. This root stock was chosen for its resistance to root rot. Each tree was planted in a hole large enough for the pot and then soil was mounded up 1-2 feet at the base. After planting, they spread the reserved chip material over each mound. Each tree received 8 ounces of 11-7-14+18S+Zn+Fe and was irrigated again with 40 gallons of water. Baby trees in their mounds with new irrigation lines. Using backpack sprayers, the crews sprayed foliage and soil with 0-28-25, 0-60-0, growmore 20-20-20 and super thrive phsphorus acid nutrient mix. This will be the first of several applications this year for the baby trees. Each tree was also sprayed with white paint to keep them from getting sunburned. So now all we can do is wait for approximately three years before we can get our first harvest! Meanwhile, we still have two blocks in the grove with old trees to be redeveloped. We turned off the irrigation on one block because the trees in this area are dead and cannot be salvaged by stumping. The’ll be removed. The last block of trees will be stumped later in the summer or fall. Gary determined that 6 of the trees that we previously stumped last fall are unrecoverable because they have not sprouted new growth. He cut these trees to the ground and chipped the wood. Finally, 9 trees near the top of the pad (that had previously provided us glorious shade when we visited!) were also stumped to 7′ and painted with white latex paint to protect for sunburn. So all in all, our grove is now a hodgepodge of 262 baby trees, 62 6-month old stumped trees, 9 newly stumped trees, approximately 100 dead trees to be removed, and another 97 or so 30+ year-old tall trees to be stumped! Plus, we have a few empty spaces from the 6 trees that did not survive stumping. We got a little of everything, but this way the redevelopment (i.e. costs) will be staggered. Trees recently stumped in May. Baby avocados on one of our older trees. Lush growth on 7-month stumped tree. Close-up of painting on baby tree. Jack next to an older tree with baby trees in background. Evan surrounded by our older trees to be stumped in fall. Chipped wood covering planting mound. New trees on left next to stumps of removed trees on right.